Have you ever seen 500 pumpkins floating down a river? If you venture to the banks of the Caney Fork River near Center Hill Dam next Saturday, you’ll have the chance. 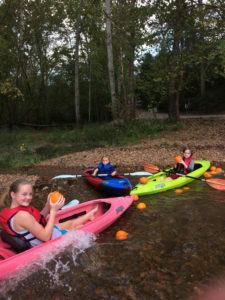 For the third year in a row, Caney Fork Outdoors is hosting “The Great Caney Pumpkin Run,” an event for kids from ages two to 14. On the morning of October 21, employees will put 500 cantaloupe-sized pumpkins into the river. Each pumpkin will have a different number on it. At 11:00, the Pumpkin Run will begin. “About fifty kids participate in this event,” Janis told me, “and you wouldn’t believe how excited they get when they see all those little pumpkins bobbing on the water. It’s absolutely adorable.” While the grown-ups paddle, the kids lean over the side of the boat to retrieve as many pumpkins as they can. The number on each pumpkins corresponds with a prize that’s handed out once the six-mile river journey is over. The Great Caney Pumpkin Run is always a sell-out so Janis urges those interested to sign up as soon as possible by calling (931) 858-5222. And for those who are surprised, as I was, that pumpkins actually float, here’s the reason why. Density, not weight, is the determining factor. Any object denser than water will sink. Any object less dense than water will float. Whether it’s a mini-pumpkin small enough to fit in the palm of your hand, a record-setting gigantic pumpkin or any size in between, a pumpkin is mainly hollow inside. Because its pulp and seeds surrounded a whole lot of air, it will float. If you don’t believe me, head down to the Caney Fork River next Saturday and see for yourself.